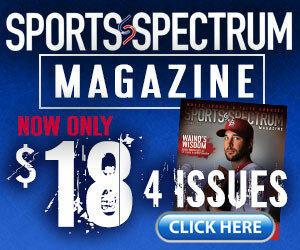 Brinson Pasichnuk has experienced the highs and lows that come with sports, inside and outside the game. 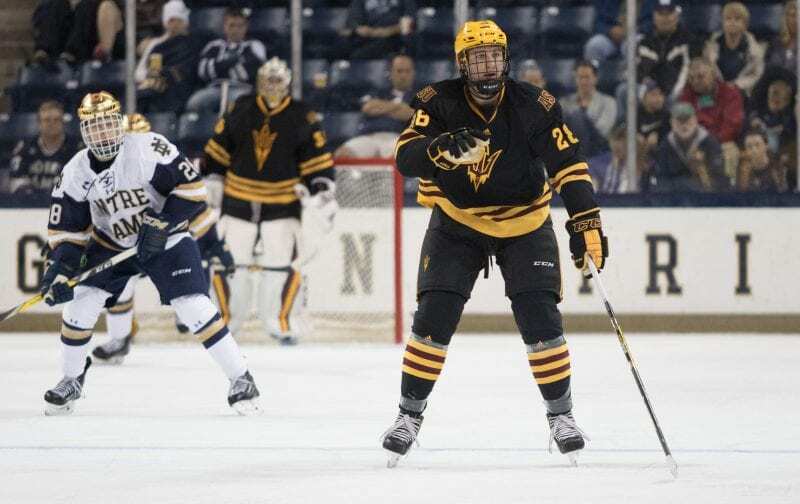 The difference is that he is now learning to live in the stability that a relationship with Christ brings, while pursuing his professional hockey dreams at Arizona State University alongside his brother and teammate, Steenn. The sons of Mike and Kathi Pasichnuk, the brothers grew up in Bonnyville, Alberta, a town of less than 10,000 people approximately a seven-hour drive north of the Montana border. Steenn, 23, is Brinson’s elder by three years, but it became apparent early on that both brothers had a knack for the game of hockey, and they dreamed of playing together. That goal was realized when they played together for their hometown team, the Pontiacs, in the Alberta Junior Hockey League (AJHL). “Playing together in junior was always a goal for us, for sure. We had always talked about it and wanted to do it, so it was a dream for our parents and us when that happened,” Steen said. Steen joined the team at the end of the 2012-13 season, and Brinson joined at the conclusion of the 2013-14 season. A winger, Steen registered 105 points in three-plus seasons, while Brinson, a defenseman, posted 95 points in two-plus seasons and led the league in defenseman scoring in 2015-16, with 65 points in 52 games including 20 goals. While in junior, Brinson played in the World Junior ‘A’ Championship, was named in the NHL Central Scouting Report, and was the only AJHL player named to the NHL prospects list during the 2016-17 season. The brothers had aspirations to play college hockey, but it looked likely that their days as teammates would end in junior. Steenn says the thought of playing together in college hatched when he began receiving interest from schools during his 20-year-old season in Bonnyville, including Arizona State. They joined ASU for the 2016-17 season, which was just the program’s second season playing a split schedule in both the ACHA Div. 1 and NCAA Div. 1 as the program begins the transition to achieve full NCAA Div. 1 status. In addition to the obvious difference in climate from central Alberta and the non-traditional hockey market of Tempe, Ariz., there has also been the setting for a transformative change in the way Brinson approaches both life and hockey. Although college life and hockey filled most of the time and thoughts for Brinson and Steenn when they arrived in Tempe, they still had faith consciousness. Steenn recalls a friend, Nick Parkos, inviting the brothers to an Easter church service during their freshman year in 2017. Brinson, who had battled and masked depression for seven years, explains that for him, meeting Nick was the start of a process. 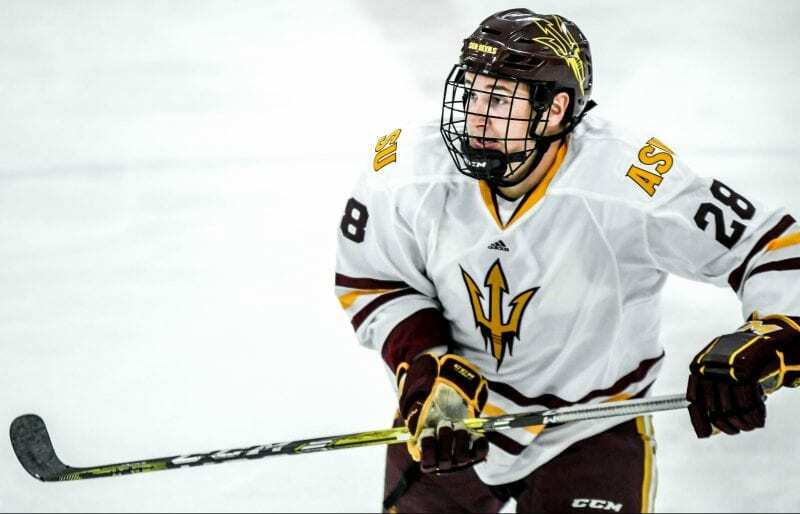 He resumed discussions and Bible study with Nick, as well as ASU hockey teammate Gage Mackie, a freshman at the time whom Brinson now describes as his best friend. Then came a pivotal dinner with his pastor in October of his sophomore year. “My pastor said, ‘Tonight could be the night where you surrender your life to God and give Him everything, or you could decide not to, but you’re making a decision either way,” Brinson said. Brinson remembers his heart racing, as he knew he needed to begin wholeheartedly living for God. Brinson says that God has worked miracles in his life since that night. “There were times when I battled depression, when I couldn’t get suicidal thoughts out of my mind; it was terrifying,” Brinson said. “I felt so guilty about it for so many years, and on October 29, 2017, when I met Jesus that night with my pastor, God completely healed me of all of that,” he said. He said that now instead of asking God why he went through depression, he thanks God for seeing him through it, because his testimony can now help others who may be going through similar battles. “God loves you more than you could ever imagine. All He wants is for you to talk to Him and ask Him into your life. It’s that simple, and it’ll be the best decision you ever make,” Brinson said. Brinson now wakes up every morning with joy and a desire to serve others, and says he aims to be a person, and a teammate, that others are comfortable to be around and know that they can talk to, free of judgement. He says that by simply living the way he knows God has called them to, he and Mackie — a 6-foot-4’ center from Anchorage — have had opportunities to share Jesus with others. He says the answer to that question is simple. 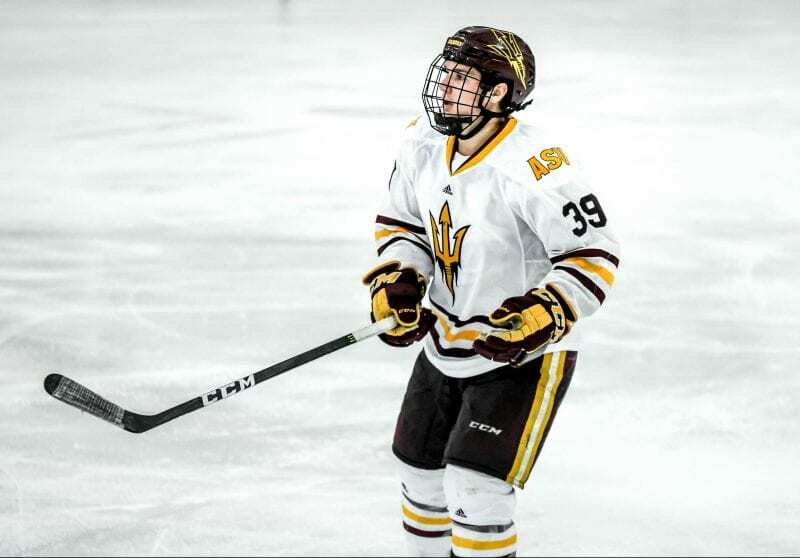 Steenn says that pursuing faith while attending and playing college hockey at ASU, which carries a reputation as a party school, is not as difficult as one might think. He points to faith programs on campus including Arizona State’s chapter of the Fellowship of Christian Athletes, as well as a team chapel, which is run by the players themselves. Tattooed on Brison’s chest is a reference to Philippians 4:13, and he says that he leans on Philippians 4:12-13 for stability, no matter the circumstance. “Whenever I’m going through something hard, I reflect on that and realize this is for a reason. God is causing this to work for my good. ‘Calm down, Brinson; Jesus has got you!’” Brinson said. The Pasichnuks were among their team’s best and most relied upon players in junior hockey, and Brinson is the team captain at ASU. He was also named team co-MVP, leading the team in scoring as a sophomore defenseman. While playing in the NHL remains a dream and an aspiration of his, Brinson now approaches it with the peace that comes with knowing that God is in control.